Objectives: To test the association between childhood IQ and mortality over the normal human lifespan. Subjects: All 2792 children in Aberdeen born in 1921 and attending school on 1 June 1932 who sat a mental ability test as part of the Scottish mental survey 1932. Main outcome measure: Survival at 1 January 1997. Results: 79.9% (2230) of the sample was traced. Childhood mental ability was positively related to survival to age 76 years in women (P<0.0001) and men (P<0.0001). A 15 point disadvantage in mental ability at age 11 conferred a relative risk of 0.79 of being alive 65 years later (95% confidence interval 0.75 to 0.84); a 30 point disadvantage reduced this to 0.63 (0.56 to 0.71). However, men who died during active service in the second world war had a relatively high IQ. Overcrowding in the school catchment area was weakly related to death. Controlling for this factor did not alter the association between mental ability and mortality. Conclusion: Childhood mental ability is a significant factor among the variables that predict age at death. Socioeconomic status, educational level, and mental ability are closely related. However, there is little information about the link between mental ability and morbidity and mortality. Mental ability was significantly associated with longevity in a longitudinal study of Australian Vietnam veterans after discharge,13 and in old people whose mental functions were declining.14 15 We examined the effects of childhood mental ability on survival up to 76 years in a year of birth cohort. Under the auspices of the Scottish Council for Research in Education, an intelligence test (the Moray house test No 12) was given to all Scottish children who were born in 1921 and were attending school on 1 June 1932.16 This was called the Scottish mental survey 1932 and provided a unique record of intelligence test scores for a complete age group of school children.17 Test data were obtained for 87 498 children (44 210 boys and 43 288 girls). We obtained survey data from the Scottish Council for Research in Education. For each subject, these data comprised family name, given name, date of birth, name of school, and raw Moray house test score. We identified Aberdeen city as our target area and searched for all subjects (n=2792) who had attended schools within its boundaries using public and health records in the United Kingdom. We began a forward search in the Register of Deaths from 1932 until 1997. Untraced subjects were then sought in the Scottish Community Health Index, which records everyone registered with a family doctor (more than 99% of the population). For untraced women, we next examined the Register of Marriages in Scotland from 1937 onwards. When we discovered that an untraced woman had married in Scotland, we repeated searches using her married name in the death register and the community health index. Subjects remaining untraced were sought by computerised and hand searching of the NHS Central Register in Southport. We obtained ethical approval for the study from multicentre research ethics committee (Scotland), and Grampian local research ethics committee, and the privacy committee of the NHS Central Register. We used one way analyses of variance with conservative post hoc (Scheffe) tests to compare the age adjusted Moray house test scores for dead, living, and untraced subjects and those known to have moved away from Scotland. We tested the influence of childhood IQ on subsequent survival using Cox's proportional hazards regression, including exhaustion analysis. Men who died in combat during the second world war were compared with other men in terms of childhood mental ability using Student's independent t tests. For the subsample of deceased subjects, we tested models of association among childhood IQ, social factors, and age at death using partial correlation and structural equation modelling (with the EQS program). We traced 2230 (79.9%) of the 2792 subjects tested in schools within Aberdeen city in 1932. On 1 January 1997, 646 men had died, 507 were alive, 247 could not be traced, and 27 were known to have moved from Scotland between 1987 and 1997; 438 women had died, 594 were alive, 315 could not be traced, and 18 had moved from Scotland between 1987 and 1997. Subjects who died before 1 January 1997 had a significantly lower mean IQ at age 11 years than subjects who were alive or untraced (table 1). This effect was also seen when men and women were analysed separately. Overall, untraced subjects had childhood IQs similar to those of subjects who were still alive. A Cox regression analysis including all traced subjects (alive, dead, and moved out of Scotland) showed that IQ at age 11 years on 1 June 1932 was significantly related to survival up to age 76 years on 1 January 1997 (P<0.0001, table 2). While gathering data for a follow on report, we rechecked all deceased people to obtain death certificate details. These checks discovered that 39 people whom we had coded as dead (based on community health index information or notes available in the General Register Office) had no death certificate available. Their mean IQ was 108.0 (SD=10.3). Inclusion of these people as dead leads to a small underestimate of the true effect of IQ on survival. To illustrate this, we reassigned the 39 from the dead to the untraced category and redid the main univariate Cox proportional hazards regression analyses. The change in survival expectancy showed slightly stronger associations as follows: from 0.9847 to 0.9840 for all subjects, from 0.9887 to 0.9883 for men, and from 0.9775 to 0.9765 for women. We prefer to let the more conservative estimates stand. The influence of childhood IQ on survival was weaker in men than in women. This could be due to the effect of the second world war on death rates in men. 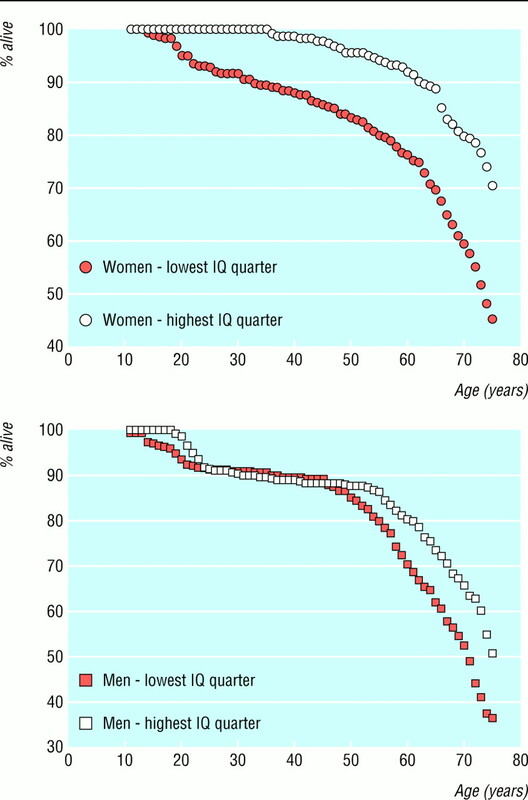 Figure 1 shows that women with a high childhood IQ had a consistently better average survival expectancy than women with low childhood IQ. However, for men with a high IQ, survival suddenly drops during the second world war and does not catch up and improve on that in men with low childhood IQ until later in life. The implications of the Cox regression analyses can be shown by comparing the mean probabilities of people of different childhood IQ levels being alive on 1 January 1997. When subjects with 1 SD difference in childhood IQ are compared, the chances of those with the lower IQ being alive on 1 January 1997 are 79% for all subjects (95% confidence interval 75% to 84%), 71% for women (64% to 78%), and 83% for men (76% to 89% including only those alive on 1 January 1950). If the IQ difference is 2 SD—for example, 85 v 115—the relative mean chances of survival for those with the lower IQ compared with those with the higher IQ are 63% for all subjects (56% to 71%), 51% for women (42% to 61%), and 68% for men (58% to 80%). Overcrowding in the childhood school's catchment area was significantly related to survival when all subjects were included (table 2). The effect was significant in men but not in women when the sexes were analysed separately. Overcrowding was significantly correlated with childhood IQ score (r=−0.22, P<0.001); children with higher ability scores tended to live in catchment areas with less overcrowded homes. Controlling for overcrowding hardly altered the association between childhood mental ability and survival. Details of these results are available from the authors. Complete data on IQ at age 11, father's occupation, overcrowding in the school's catchment area, and age at death were available for 722 subjects. IQ correlated with age at death (0.18, P<0.001), overcrowding (−0.22, P<0.001), and father's occupational category (−0.20, P<0.001; more professional occupations have lower numbers). Father's occupational category correlated significantly with overcrowding (0.09, P=0.01) but not age at death (−0.02, P>0.05). Overcrowding was not significantly correlated with age at death (0.02, P>0.05). The correlation between IQ at age 11 and age at death after father's occupation and overcrowding were controlled for was 0.19 (P<0.001). We used the EQS structural equation modelling program competitively to test models of these data that did and did not assume direct effects of IQ, father's occupation, and overcrowding on age at death. The best fitting model conceptualises IQ at age 11 as a mediating variable between social factors and age at death (fig 2). Models which assumed direct effects of the available social factors on age at death and those which assumed social factors as mediators between IQ and age at death had unacceptable fit statistics. Our data show that high mental ability in late childhood reduces the chances of death up to age 76 years. The effect is not caused by a single factor and may even be reversed, as was found for men during the second world war. This result adds to our knowledge of the personal traits in youth that contribute to survival in subsequent decades. Studies of an unrepresentative sample of children with high ability in the United States found that conscientiousness, lack of cheerfulness, and permanency of mood (for men only) were associated with living longer.18 In our study, women with a deficit in IQ of 15 points at age 11 had less than 75% survival and those with a deficit of 30 points were about half as likely to survive. The association between higher childhood IQ and an increased risk of dying in the second world war requires further investigation. Part of the effect might be explained by some men being rejected for active service because of low mental ability. More evidence is needed on the roles fulfilled by people of higher mental ability in the war and, indeed, whether the relation is true beyond Aberdeen. We found a weak association between estimated overcrowding in the area of the childhood family home and survival. However, the association between childhood IQ and survival was not affected by controlling for overcrowding. The association was also unaffected by controlling for overcrowding and father's occupational category in the subsample of people who were dead by January 1997. These analyses were conducted on a smaller and less representative sample than our main results. Various, non-exclusive, explanations exist for the association between childhood IQ and survival. These include genetic factors, environment before and after birth, childhood illness, and nutrition and other privation. Childhood IQ as record of bodily insults—The mental ability test was taken in 1932, at a time when poverty was far greater and health standards were lower than at present. IQ at age 11 years could therefore reflect the effect of multiple factors on the developing brain. These might include the quality of antenatal care, prenatal and postnatal nutrition, and the disabling effects of chronic childhood physical illnesses. In this scenario, childhood IQ in part represents a record of the subject's neurological tribulations before age 11. As such, childhood IQ might be seen partly as a mediator between physical and social disadvantage and survival. These effects could be cohort specific. Childhood IQ as predictor of entry to safer environments—Higher childhood IQ in men, especially in the early and middle decades of the 20th century, may have allowed entry into relatively safe employment (with wartime an important exception). In women the effect of a higher childhood IQ was possibly more indirect. Women with higher childhood mental ability might have married higher ability men and benefited indirectly from reduced exposure to occupational hazards, material privation, and, critically, the impact on family life of the husband's premature death because of dangerous work. Thus childhood mental ability is, arguably, a conveniently measured, relatively reliable, and valid indicator for several disparate antecedents and outcomes. 12 22–25 The effect of IQ is difficult to separate from the effects of social class and education. These variables are moderately highly correlated, and one can act as a surrogate for one or more of the others in causing associations. For example, personality traits have been found partly to explain associations between childhood social class and poor health in adulthood.26 The US national longitudinal study of youth showed that, within the white American population, both parental social class and cognitive ability in the late teens were associated with multiple indices of social, educational, and occupational outcomes many years later, although the effects were often small.22 27 Social class and mental ability would often retain their influence on outcomes after the covariation was statistically controlled for. This indicates that mental ability is not entirely a surrogate for social class and vice versa. We found that overcrowding was a less powerful predictor of survival than childhood IQ and that controlling for overcrowding had little effect on the association between childhood mental ability and survival. Other, more reliable and valid ecological measures or personal measures of social disadvantage might prove more powerful.6 Our data do not allow us to tease apart the causal influences among IQ (and other personal variables such as personality traits and coping styles), education, and social class. This would require larger and more homogeneous samples. We traced nearly four fifths of our target sample after a gap of about 65 years. This is higher than the percentage traced in landmark studies examining the influences of early life on health in old age. For example, Barker and colleagues' study of infant weight and death from ischaemic heart disease was based on a tracing of 71% of men.28 Tracing in other influential studies is lower.6 Nevertheless, it is possible that the association we found could be nullified or reversed by data from the 20% of people we could not trace. One reason for not being able to track subjects was migration. Migrants are a relatively healthy group29 and had an average mental ability in our study. Although such evidence is not definitive, it suggests that severe bias in the opposite direction to our association is unlikely. In our cohort childhood IQ was a significant predictor of human survival. We do not know, however, whether this effect is cohort specific. Other possible mechanisms for the effect include previous childhood privation, the adoption of healthy behaviours in adulthood, and access to safer environments. Future studies on the causes of inequalities in health and mortality should investigate childhood mental ability as one of the factors. We thank the Scottish Council for Research in Education, especially Graham Thorpe, for providing data from the Scottish Mental Survey 1932. Elizabeth and Patricia Whalley traced subjects in public records. David Hunter assisted in compiling and checking data. Steven Leaper assisted with census data. Professor Gordon Murray provided statistical advice and suggestions. Contributors: LJW and IJD had the original idea for the study and contributed to its design. LJW coordinated the collection, compilation and checking of data, discussed the analyses, and made critical revisions to the paper. IJD contributed to the coordination of data compilation, designed and conducted the analyses, and wrote the first draft of the paper. The authors are joint guarantors of the paper. Funding The chief scientist's office of the Scottish Executive and Henry Smith's Charities supported this research. .Social class mortality differentials: artefact, selection or life circumstances?J Epidemiol Community Health1985; 39:1–18. .Inequalities in health: report of a working group chaired by Sir Douglas Black.London:Department of Health and Social Security,1980. .Deprivation and mortality in Scotland, 1981 and 1991.BMJ1994; 309:1465–1470. .Inter-mediating risk factors in the relation between socioeconomic status and 25-year mortality (the Zutphen study).Int J Epidemiol1989; 18:658–662. .Social deprivation and premature mortality: regional comparison across England.BMJ1993; 307:1097–1102. .Review of the evidence on fetal and early childhood antecedents of adult chronic disease.Epidemiologic Rev1996; 18:158–174. .Adverse socioeconomic conditions in childhood and cause specific adult mortality: prospective observational study.BMJ1998; 316:1631–1635. .Adult mortality and level of education: a comparison of six countries. In: Fox J, ed. Health inequalities in European countries.London:Gower,1989:142–160. .Educational level and mortality in a 32-year follow-up study of 18-year old men in the Netherlands.Int J Epidemiol1990; 19:374–379. .The size of mortality differences associated with educational level in nine industrialised countries.Am J Pub Health1994; 84:932–937. .Intelligence: knowns and unknowns.American Psychologist1996; 51:77–101. .Ultimate validity of psychological tests.Personality and Individual Differences1992; 13:699–716. .The association between change in cognitive function and longevity in Dutch elderly.Am J Epidemiology1990; 132:973–982. .Health, cognitive and psychosocial factors as predictors of mortality in an elderly community sample.J Epidemiol Community Health1999; 53:83–88. .The intelligence of Scottish children: a national survey of an age-group.London:University of London Press,1933. .The level and trend of national intelligence.London:University of London Press,1961. .Sociodemographic and psychosocial factors in childhood as predictors of adult mortality?Am J Public Health1995; 85:1237–1245. .The stability of individual differences in mental ability from childhood to old age: follow-up of the 1932 Scottish Mental Survey.Intelligence2000; 28:49–55. .Childhood mental ability and dementia.Neurology2000; 55:1455–1459. .Linguistic ability in early life and cognitive function and Alzheimer's disease in late life.JAMA1996; 275:528–532. .The bell curve: intelligence and class structure in American life.New York:Free Press,1994. .Human cognitive abilities: a survey of factor-analytic studies.Cambridge:Cambridge University Press,1993. .IQ and human intelligence.Oxford:Oxford University Press,1998. .Looking down on human intelligence: from psychometrics to the brain.Oxford:Oxford University Press,2000. .Social class in childhood and general health in adulthood: questionnaire study of contribution of psychological attributes.BMJ1999; 318:18–22. .Inequality by design: cracking the bell curve myth.Princeton, NJ:Princeton University Press,1996. .Weight in infancy and death from ischaemic heart disease.Lancet1989; ii:577–580. .Migration and morbidity: implications for geographical studies of disease.Soc Sci Med1988; 26:49–54.